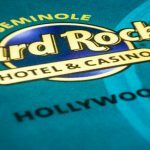 A professional poker player from Florida, Christopher Vitch has won the event#40 of the World Series of poker 2016. 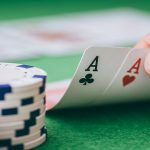 The event was for $2,500 buy in Mixed Triple draw, which attracted 236 players worldwide and generated a cash prize pool of amount $536,900, top 36 places of the tournament took home some amount of money. The player collected his first gold bracelet at the tournament and was able to collect $136,854 as first prize. Austrian Siegfried Stockinger was the runner up of the game and got an amount $84,572, as winning total. 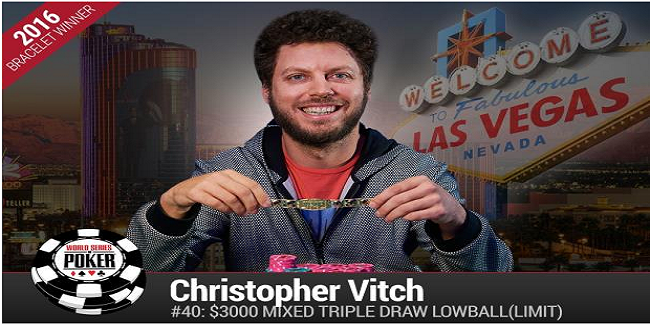 This was the 14th cash at WSOP for Vitch, the winner of the latest edition. He has been through 5 final tables, but won only one. Lifetime earnings for the earning exceeds to $509,777. The 33 year old player was very happy and said that I love to play cash games, I don’t like playing poker tournament here and there, but I thought I should give a chance to myself and here it is, I’m the winner of this prestigious tournament, This is simply amazing to me and I can’t express it in words. He also said that I registered late, because I was in six handed limit game and was looking to do well at that tournament, but now I think I can do good at triple draw events as well, because of this perfect winning. 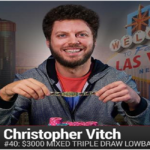 First, second and third position so the $2,500 buy in Triple draw events belongs to players named as Christopher Vitch from Florida won($136,854),Siegfried Stockinger, from Austria wins $84,572, being second, whereas David Gee from Gilbert completed third for $55,511. Damjan Radanov, from Memphis hit the rail for fourth place and took home $37,375 as winning total. 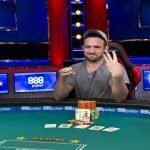 Michael Schiffman, from Henderson played well and having good number of chip counts but somehow couldn’t kept the momentum and got busted to fifth position for a total winning share of amount $25,830, whereas an Australian Gary Benson comes sixth in the list with total winning amount $18,336. The first elimination from final seven players was of Anthony Lazar, a pro poker player from Maple Grove, who hit the rail for 7th place and $13,380. 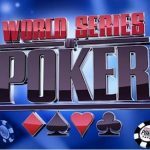 This was the event#40 of the WSOP 2016 (which features 69 gold bracelets in it). 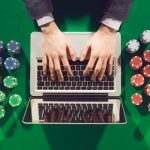 Stick to real poker online and we’ll let you know every detail about the series.